Learn about the rules for 180 degree rotation in anticlockwise or clockwise direction about the origin. 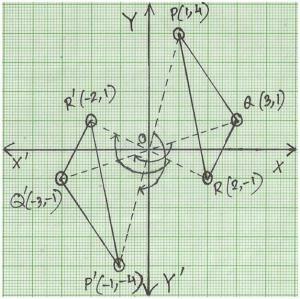 How do you rotate a figure 180 degrees in anticlockwise or clockwise direction on a graph? Rotation of a point through 180°, about the origin when a point M (h, k) is rotated about the origin O through 180° in anticlockwise or clockwise direction, it takes the new position M' (-h, -k). 1. Find the co-ordinates of the points obtained on rotating the points given below through 180° about the origin. When rotated through 180° anticlockwise or clockwise about the origin, the new position of the above points is. 2. 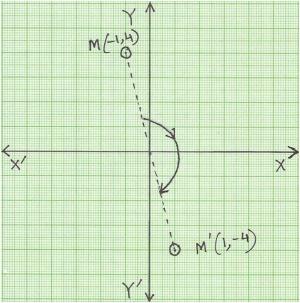 Plot the point M (-1, 4) on the graph paper and rotate it through 180° in the anticlockwise direction about the origin O. 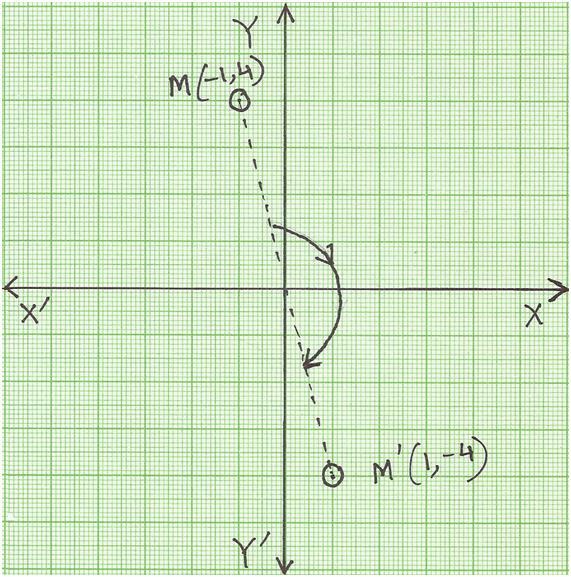 Find the new position of M.
When rotated through 180° in the anticlockwise direction about the origin O, then M (-1, 4) → M'' (1, -4). 3. Draw a line segment joining the point P (-3, 1) and Q (2, 3) on the graph paper and rotate it through 180° about the origin in anticlockwise direction. On plotting the points P (-3, 1) and Q (2, 3) on the graph paper to get the line segment PQ. Thus, the new position of line segment PQ is P'Q'. 4. 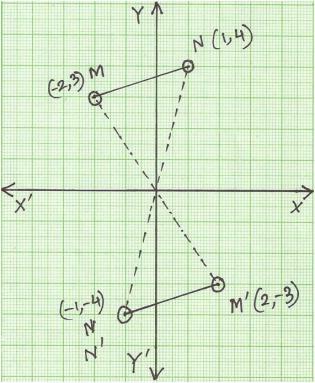 Draw a line segment MN joining the point M (-2, 3) and N (1, 4) on the graph paper. Rotate it through 180° in anticlockwise direction. 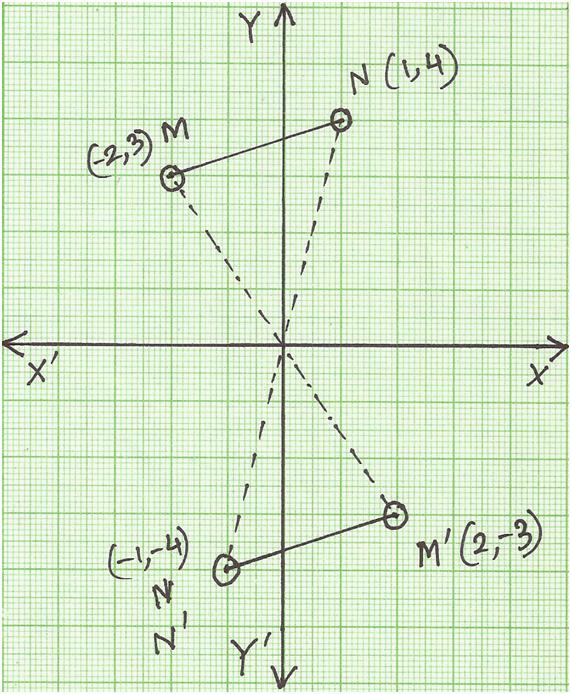 On plotting the points M (-2, 3) and N (1, 4) on the graph paper to get the line segment MN. Thus, the new position of line segment MN is M'N'. 5. 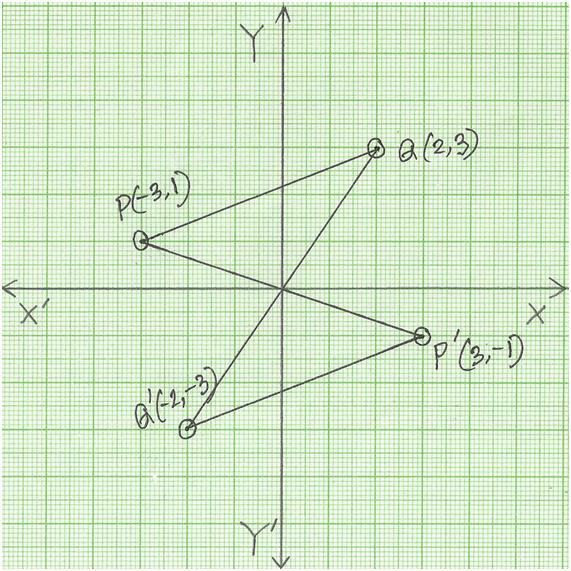 Draw a triangle PQR by joining the points P (1, 4), Q (3, 1), R (2, -1) on the graph paper. Now rotate the triangle formed about the origin through 180° in clockwise direction. Thus, the new position of ∆PQR is ∆P’Q’R’.